An examination of the birth of the known universe, spanning eons from the Big Bang to the dinosaur age to our present human world, this full-length documentary searches for humanity’s place in the future. It also expands on the footage that special effects stars Douglas Trumbull (2001) and Dan Glass (The Matrix) created for The Tree of Life. 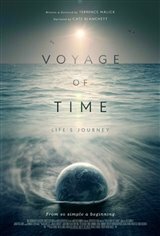 Directed by Terrence Malick and narrated by Cate Blanchett, Voyage of Time: Life's Journey is a 90-minute comprehensive journey through never-before-seen monumental events that shaped the Earth as we know it today.